An innovative, scientific Reef Restoration Research Project is underway at Quicksilver’s platform, right in front of you, here on Agincourt Reef 3. This important project, conducted by Quicksilver and researchers from Reef Ecologic, is aimed at helping to preserve the significant ecological, social and economic values of the Great Barrier Reef World Heritage Area. What led to this Reef Restoration Project? Due to a combination of natural events, including cyclonic wind and waves several years ago, a patch of reef close to the pontoon was damaged. As a result, an area of coral rubble formed and with an unstable substrate, the natural recovery of new corals was impeded. After consultation with the natural area managers, the Great Barrier Reef Marine Park Authority, we were issued with the permit to conduct a rehabilitation research project at this site. It’s the first time this type of reef restoration strategy has ever been undertaken on the Great Barrier Reef. Quite simply, the Project involves the installation of a mesh structure underwater to grow coral connected to a power source. 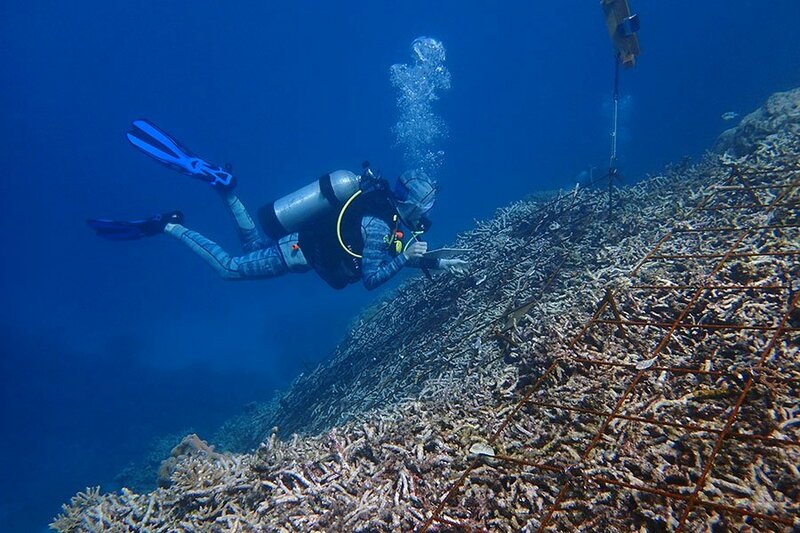 To do this, three steel mesh panels of 1.5 metres (5ft) x 3 metres (10ft) have been placed over the coral rubble. This stabilises the rubble so small coral “recruit colonies” can be attached onto the mesh. The mesh is attached to a power source and 5 volts of electric current is delivered to the mesh from batteries on the pontoon. This has the effect of assisting the corals to deposit calcium carbonate (coral skeleton) at a rate up to three times greater than normal. 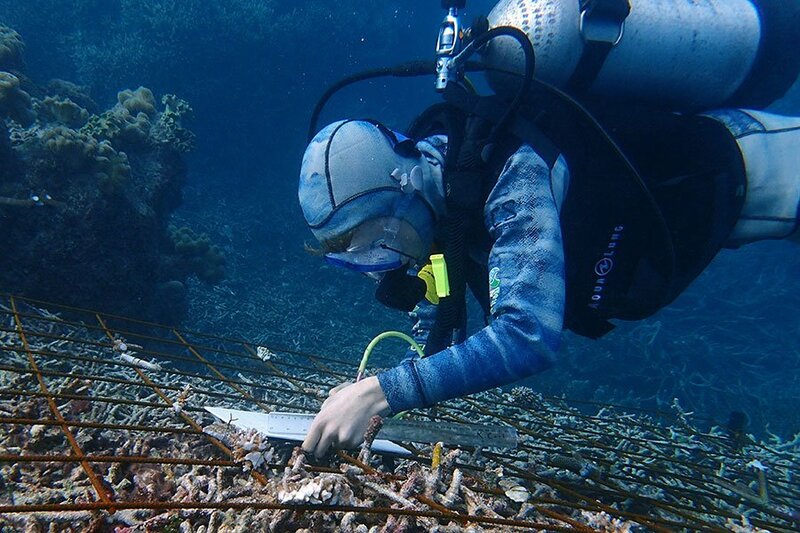 So we can evaluate the success of the Project, three identical sized “control” mesh panels with similar coral colonies attached have also been placed underwater, but these mesh panels are not connected to a power source. This enables us to compare the growth rates of corals on the mesh with the power source, to those without. When snorkelling near this area, you may see the research site. It is safe and poses no threat to any marine life. The mesh was installed in the research site over a period of three days in mid July 2018. The coral colonies will be measured regularly throughout the trial period to compare growth rates. It is hoped that this rehabilitation technique, which has never been attempted on the Great Barrier Reef before, will assist in making areas such as this research site, more resilient to stress in future natural disturbances. If successful, this technology could help support reef resilience in many locations across the Great Barrier Reef and other reef systems in the world. Who is conducting the Project? This research project is a partnership with Quicksilver’s Reef Biosearch team of marine biologists, Reef Ecologic and the Australian Government’s National Environmental Science Program with funding support from AMPTO.